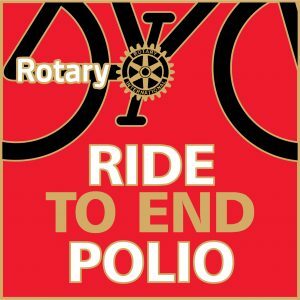 The Ride to End Polio, scheduled for November 19, 2016, is an annual fundraiser sponsored by Rotary District 5500. The ride is dedicated to Rotarian Mike Harris who founded the ride in 2009. Since that time, including a generous match from the Bill and Melinda Gates Foundation the ride has generated about $25 million for Rotary’s efforts to End Polio Now, enough money to buy more than 35 million doses of vaccine. The Ride to End Polio planning committee, in coordination with 2016-17 District Governor Sheryl L. Christensen, have established the 2016 fund raising goal, including any and all matches, at $10 million. Rotary District 6970 will have a team in this year’s edition of the Ride to End Polio led by District Governor Marshall Butler. For those who can’t make the trip to Tucson, AZ, you can still support this terrific initiative. Coordinate an indoor ride in your area, or plan a group ride on a local trail.